Karlsruhe, Germany, October 28, 2016 – EIZO GmbH announced the expansion of their CuratOR operating room (OR) solutions portfolio. With the release of the EX271W OR monitor and its two new video input modules, the TID0102 splitter, and the CID1201P application for the Large Monitor Manager (LMM) video management system, EIZO offers even more flexibility in connecting and operating system components. Designed to complement EIZO's Transmission Data Link (TDL) portfolio, the new High-Definition Link (HDL) transmission technology makes use of standard CAT6 cables to transmit uncompressed video up to distances of 70 meters. This reduces the cost of system planning and installation, particularly when deployed in conjunction with EIZO's new EX271W, a 27-inch monitor for the OR with an innovative modular design. From its inception, the EX271W was designed as a modular monitor to support targeted connectivity in the OR. With its slim design, low weight and high IP rating, the EX271W is an ideal video front-end for the LMM or other OR equipment offering state-of-the-art medical imaging at 1080p. To further expand the EX271W connectivity options, EIZO is introducing the TRM0000-HDL and TRM0000-3GS OR monitor modules. The TRM0000-HDL module allows the monitor to interface directly with the TID0102-HDL or other HDL-compatible transmitters. In this way, video information can be sent from a centralized equipment room into the OR. Similarly, the TRM0000-3GS module lets the EX271W monitor receive 3G-SDI video signals in surgical environments and to forward the signals to daisy-chained equipment via the loop-through output. With its introduction in 2008, EIZO's LMM revolutionized video management in interventional radiology rooms. This has since expanded to offer fast, flexible and convenient control of video sources in control rooms, OR and other applications with multiple video inputs. The new TID0102 splitter expands the connectivity options for the LMM and other point-to-multipoint video systems. 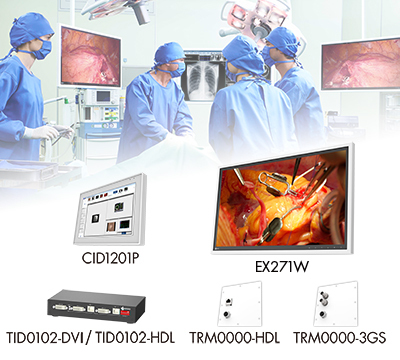 With the established DVI video interface of the TID0102-DVI, system designers can use a wider range of video components along with EIZO's growing portfolio of professional, high-resolution medical monitors. In addition to supporting control room solutions, the TID0102-HDL model splits each video output into two distinct pathways, allowing replication of the signals on two separate monitors with no additional latency or degradation of the video signal. The secondary output is ideal for use with a TRM0000-HDL module or other HDL-compatible receiver. When used in a stand-alone configuration, the TID0102-HDL can display the DVI input signal from a video management system on up to four monitors. As the successor to EIZO's CID1000P, the new CID1201P application offers a user-friendly interface for the LMM. With the higher resolution and improved touch responsiveness of modern panel PCs, the CID1201P application enables quick and intuitive selection of video sources through the LMM's view management interface. The software was designed to be robust and secure in the OR environment, and setup is as simple as specifying the LMM video management system address. Visitors to Medica 2016 in Düsseldorf, Germany will be able to see all of the new products at the EIZO booth, Hall 10, #H41 from November 14-17. The new products will be released in series at the end of 2016. Date of availability varies by country so contact the EIZO group company or distributor in your country for details. CuratOR is a trademark and EIZO is registered trademark of EIZO Corporation.